Through nostalgia-tinted glasses the world can become a different and much prettier place, but leaning too heavily on nostalgia to form your perception can lead to disappointment. Imagine wanting to revisit the beautiful, shining pizza restaurant where you had your 12th birthday party, but when you get there it has been shut down due to health code violations. Looking at screenshots from one of your favorite childhood video games could be enough to make you want to launch an expedition to dig it out of your parents’ attic, but after blowing the dust out of your system’s cartridge slot you realize that your taste in video games has changed and your expectations have been raised a little higher than they once were. Pier Solar and the Great Architects follows the story of Hoston and his two friends Edessot and Alina. Hoston’s father is knocking on death’s door, and the only thing that will keep him well long enough for the doctor to come treat him is a rare herb found in a nearby cave. Of course, said cave is known to be dark and full of terrors, so Hoston’s pals agree to venture on his quest with him. While in the cave, an ancient evil is released upon the land and the kids are turned on to the ancient mystery of Pier Solar and the Great Architects. The storytelling is done through unclever dialogue that can become tedious rather quickly. In an effort to make all of the characters relatable, they exchange a ton of flat jokes with each other, and there is one very long running gag with Alina that makes her obnoxious rather than endearing. The pacing of the game suffers due to these issues; the first two hours of playing seemed more like four or five had gone by. We have seen this schtick countless times before, and perhaps that is the point. The games that Pier Solar is derivative of often had similar problems, usually due to poor localization. You will just have to ask yourself if your desire to play a very authentic feeling retro JRPG will be enough to blind you to things that were purposefully implemented for the sake of reminiscing. 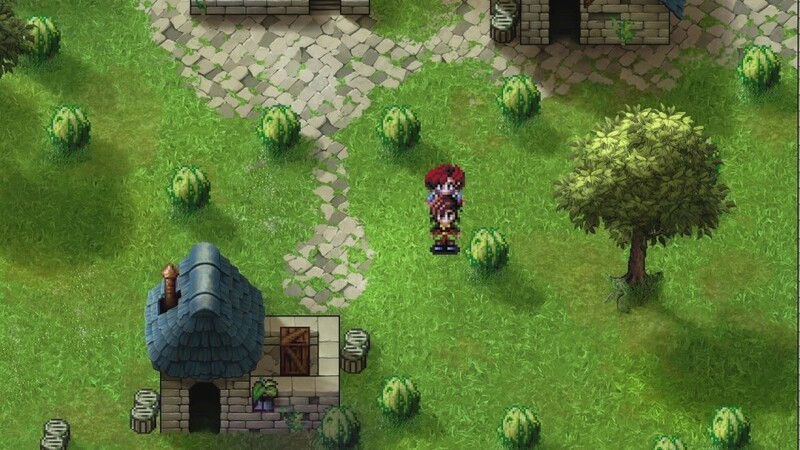 Keeping with game design tropes two decades old, Pier Solar follows a formula made famous by games like those in the Final Fantasy or Dragon Quest series. You travel to new town, load up on gear and supplies, conquer a dungeon and then move on to the next town to start the whole process over again. The trek between inhabited areas has been simplified by use of a map screen that allows players to choose what area they want to go to. This has removed some of the aimless wandering that some RPG enthusiasts no doubt love, but it allows for there to be more of a break between individual areas so that there is less of a possibility of each zone blending with the one before it. There is a good chance you will get tired of seeing the combat screen. 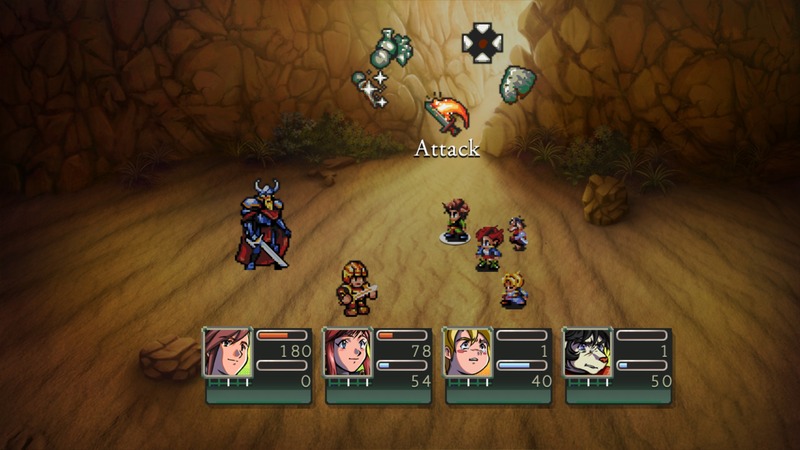 On your way to the dungeon, you will be subject to random enemy encounters and get to see the combat system in action. It is something you’ve also seen before, but the old adage of “if it isn’t broke, don’t fix it” applies here. The player can select between a physical assault, defending, offensive magic, or healing magic to use on their turn. There is also a “gather” option in the menu which makes a character skip a turn in favor of saving up a point that can be put towards unleashing a powerful special attack on an enemy on the next turn. It is a system that works well and most players will be able to pick up instinctively rather than have to think about it or wade through a lengthy tutorial. There are also some light puzzle solving and item searching tasks to complete in between battles, both of which are made needlessly difficult by some poor design choices. There were a few times a switch that needed to be activated to progress through an area was hidden behind a foreground element, or the party was sent off to find a specific item with absolutely no clues about where to start looking. While handholding in a retro game like Pier Solar was atypical, a bit of an exception could have been worked in to make the game approachable by a wider audience. Pier Solar’s shortcomings are mostly balanced by its stellar visual presentation. The art style made me feel like a kid again with its bright colors and pixel art character models. The attention paid to lighting in the game is especially nice. Buildings cast realistic shadows based on the direction of the light source and characters are shadowed appropriately when entering those areas. The lighting does get a bit muddy in areas like caves, but overall the effect works well. There are also quite a few cutscene moments where you can really appreciate the hand-drawn versions of the characters and all the work that went into creating them. Enemy designs are a bit problematic though, because the variety given to them amounts to little more than a pallet swap. Considering the high frequency of random encounters this will make many battles feel a bit mind-numbing. Moments like these are when the game really shines. The music is decent, despite some of the loops being a little short. It fits in with the old school vibe nicely, and there are some neat tricks that may not have been considered twenty years ago. In the first town, there is a house that is undergoing repairs and the sound of banging and sawing gets louder as you approach the building. Little surprises like this pop up throughout the game that will make you want to forgive the game for the annoyances it caused you in previous areas. 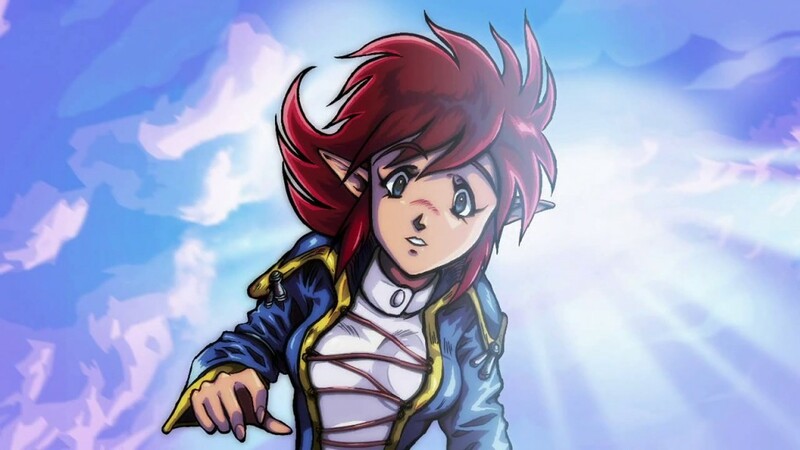 Pier Solar and the Great Architects is a game that relies heavily on the notion that your wistful whim to pick up an old school JRPG style game will be enough to sell the game to you (it was originally released on Genesis cartridges, afterall). It is essentially a fan-made homage letter to the days of 16-bit role playing games, and sadly hit a few of those old game design elements right on the nose. All the good elements of those classic games are implemented so expertly that it is clear the design team is madly in love with that era and genre of games, but unfortunately it digs up just as many defunct conventions that were better left buried. This game definitely won’t make anyone wish they hadn’t missed out on gaming in the late 80s or early 90s, but if you lived through it and are wanting to play a game that is both new and a blast from your past, then Pier Solar may just be worth checking out.